Tymon Mellor: Those who walk the Maclehose or Wilson Trails, or who enjoy walking in the country parks will be familiar with Lead Mine Pass; the high pass linking Kowloon with the New Territories. But why is it called Lead Mine Pass, where is the mine it is named after? 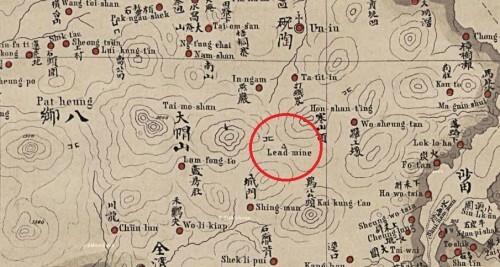 Ever since the New Territories has been part of Hong Kong, there has been a Lead Mine pass. Sitting between the mountains of Tai Mo Shan and Grassy Hill, the pass at an elevation of 400m provides a link between the Shing Mun Valley to the south and the Tai Po Valley to the north. Below is an extract of the first comprehensive survey of the area undertaken after the extension of the Colony in 1898. The map was printed in 1904 and provides the first high quality mapping of the area. Lead mine pass is clearly identified. CEDD provide a record of all the mineral occurrences and mining activates in Hong Kong on their website. 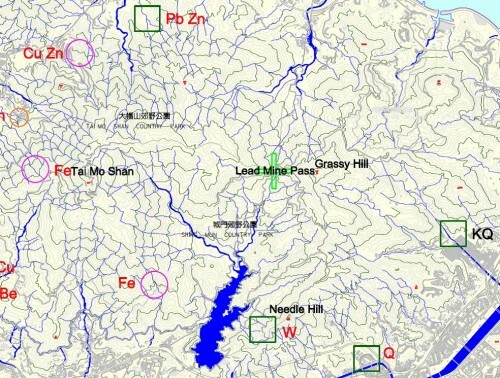 When superimposed on today’s mapping, the closest mineral workings to Lead Mine Pass are those at Needle Hill, at the foot of the Shing Mun Valley that leads to the pass. 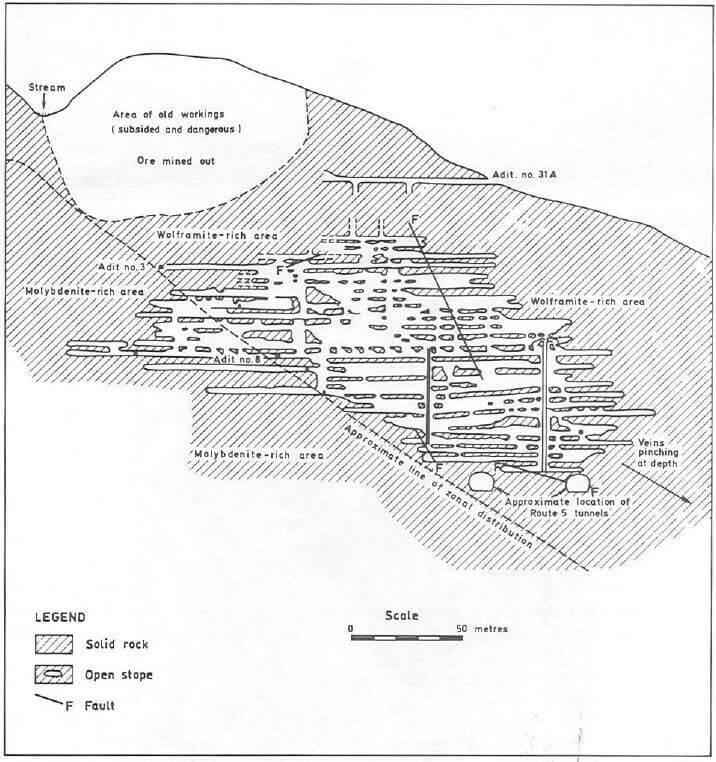 The Needle Hill mine is described in detail by K J Roberts & P J Strange in their 1991 paper. The mine extracted tungsten, wolframite and small volumes of molybdenite, there is no record of lead being extracted. During the period 1949 to 1951 there was a boom in the price of tungsten as a result of the Korean war, around 5 000 miners worked in the mine and in fox hole excavations minerals in the New Territories. By 1967 the price of the metals along with increased labour cost made the operation uneconomic and the mine was closed. 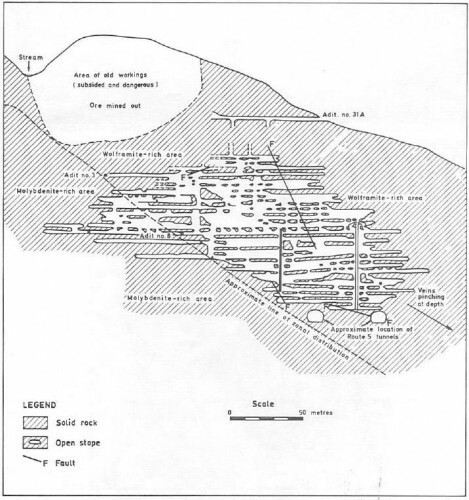 A section of the mine is shown below. The mineral deposits were discovered by Mr G Hull, an engineer working on the construction of the Shing Mun Reservoir (Jubilee Reservoir) in 1935, thus as the minerals of the mine were discovered after the extension of the Colony, this mine could not be the lead mine that gave its name to the pass. 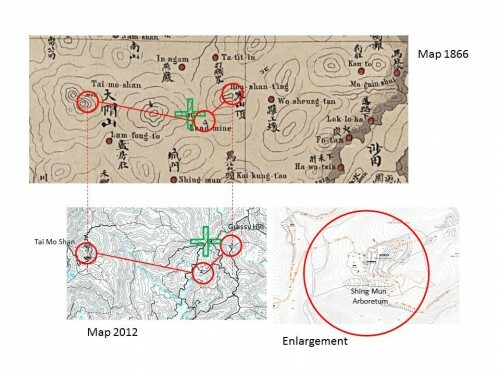 The Geological Society of the Hong Kong prepared an update to the map of the Hong Kong Minerals in their 1989 News Letter, it was noted that the mining records were incomplete, all records prior to the second world war were destroyed during the Japanese occupation. Thus, the records are not comprehensive. In October, 1898 Mr Stewart Lockhart reported on the new land that had been leased to Great Britain as part of the extension of the Hong Kong Colony. 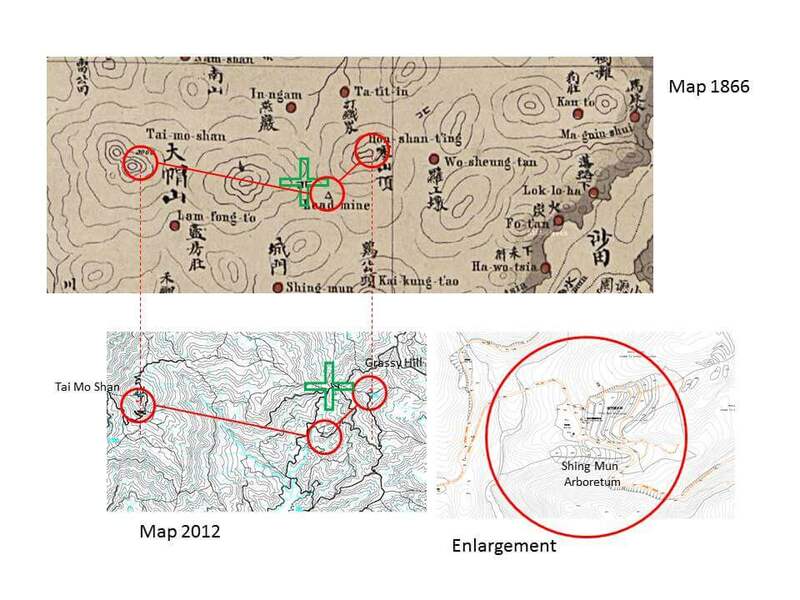 In Appendix 2 of the report covering the Geology o f the New Territories, Mr Ormsby, the Director of Public Works records; “A lead mine was worked on for some years on the side of Tai Mo Shan, but the workings discontinued for some reason about 6 years ago”. This would put the closure of the mine in 1892. The first map of the mainland, that was to become the New Territories was published in 1866 and named “The Map of the San On District”, the Chinese name for the southern area of the Guangdong providence. The title of the map records that it was; “Drawn from actual observation made by an Italian Missionary of the Propaganda in the course of his professional labours during a period of four years”. Given this dubious source of information, the map is surprisingly accurate. 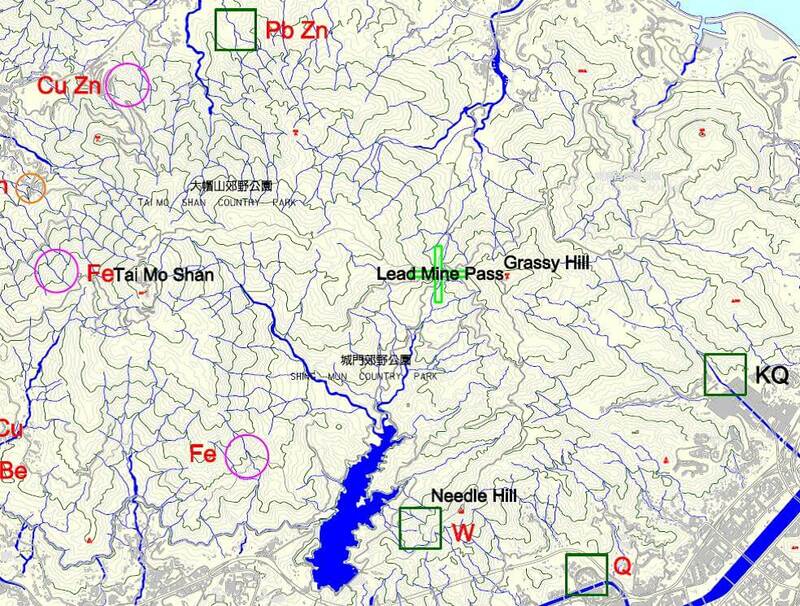 On it, we can see that a pass is identified between Tai Mo Shan and Grassy Hill, along with an adjacent “Lead Mine”. One assumes this is the mine that gave its name to the pass. 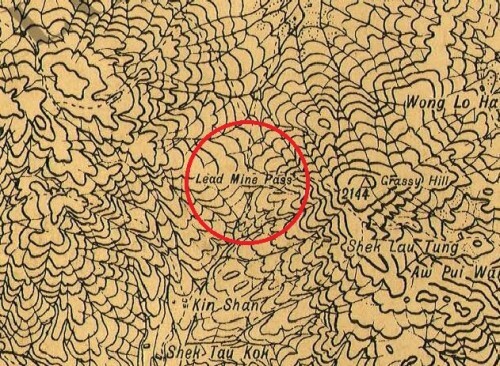 The mine is shown on the south west slopes of Hon Shan T’ing, or what is now known as Grassy Hill. When the location is transfer to a modern map, the site is uncannily close to the Shing Mun Arboretum, the only unusual topography on the hillside. 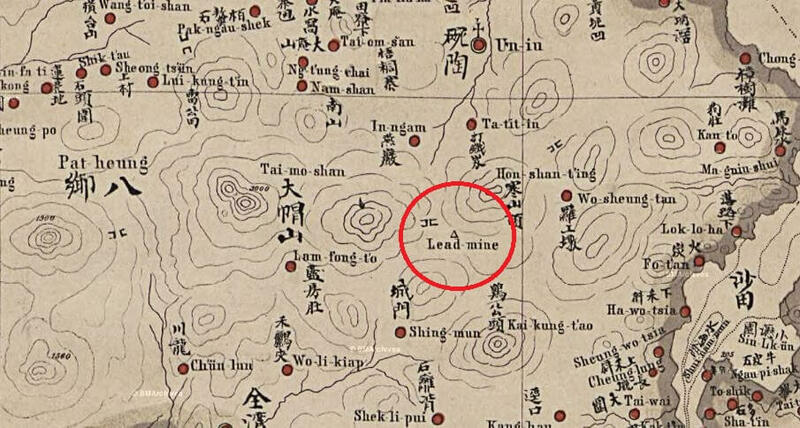 Is the Shing Mun Arboretum on the site of the old lead mine that was closed in 1892 and after which Lead Mine Pass is named? As a frequent traveler to Shing Mun i appreciate very much for your works in searching for an abandoned mine site. geology around that region is rather complicated and the lead ore is possibly formed in forms of minor intrusion (i.e. dykes) instead of a bulk volume formed under contact metamorphism (i.e. Magnetite in Ma On Shan). As a result, the potential lead outcrop on a limited surface area and villagers would have mined it in forms of trenches and small audits. It would be more sounding if we can actually find these audits on the hillside or identify some ore wastage in the proposed region. Besides, I am not sure if this arboretum part of the remains of ancient Shing Mun village. Many thanks for your comment Bob. If as you say, any mining in the Lead Mine Pass area would have been small scale, have you seen anything there which might indicate mine trenches, adits or mining waste?